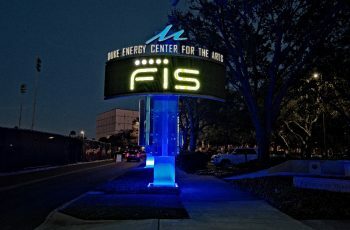 Mahaffey Theater, located on Tampa Bay in Saint Petersburg, required a Grand Entrance Statement for the primary entry into the facility. Although the architecture of the building is impressive as viewed from Tampa Bay, the actual entrance looked more like guests were entering from the receiving docks. The City of Saint Petersburg sent out a request for designs. 11 firms submitted. Creative Sign Designs was selected as the winning entry. The “Avenue of Excellence” consists of the primary pylon with the 6MM EMC, dimensional, pin mounted DUKE ENERGY CENTER FOR THE PERFORMING ARTS lettering in a deep channel construction with ½” curf cut acrylic faces for a trim cap-less finish. 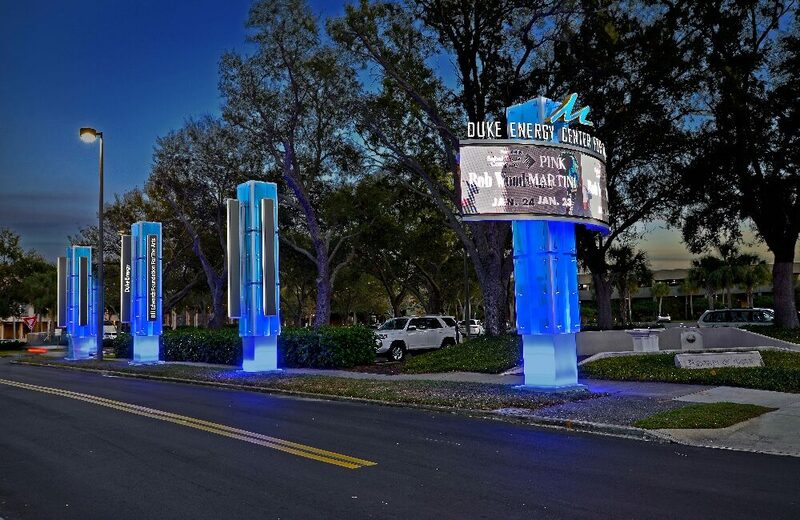 The “Avenue of Excellence” consists of the primary pylon with the 6MM EMC, dimensional, pin mounted DUKE ENERGY CENTER FOR THE PERFORMING ARTS lettering in a deep channel construction with ½” curf cut acrylic faces for a trim cap-less finish. 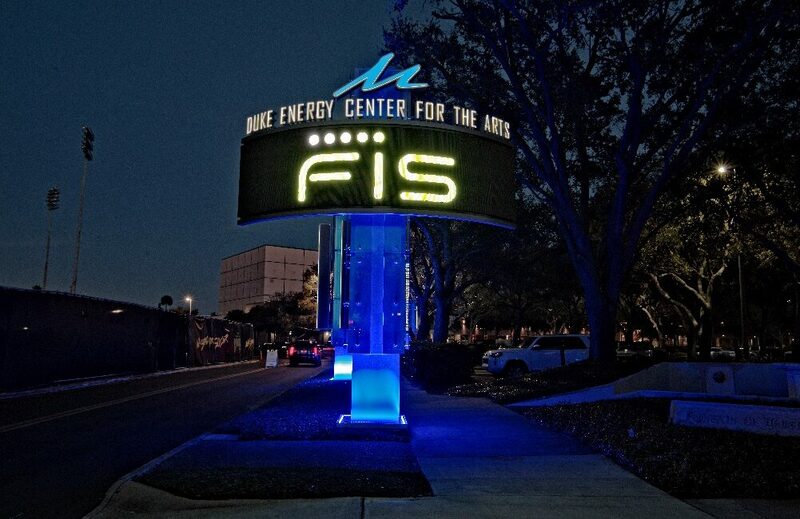 The Iconic Mahaffey “M” floats from atop the pylon with routed push-thru style acrylic channel construction, internally illuminated. Four additional Donor Statement pylons accompany and complete the Grand Entrance Feature. 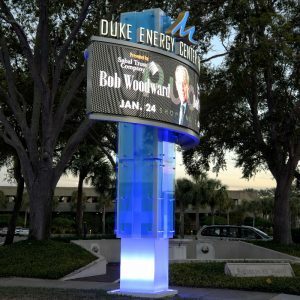 The Donor Statements consist of three projecting blades, each with routed push-thru style clear acrylic messages, each, internally illuminated. There are up to 12 opportunities for donors to be showcased on these statement displays. 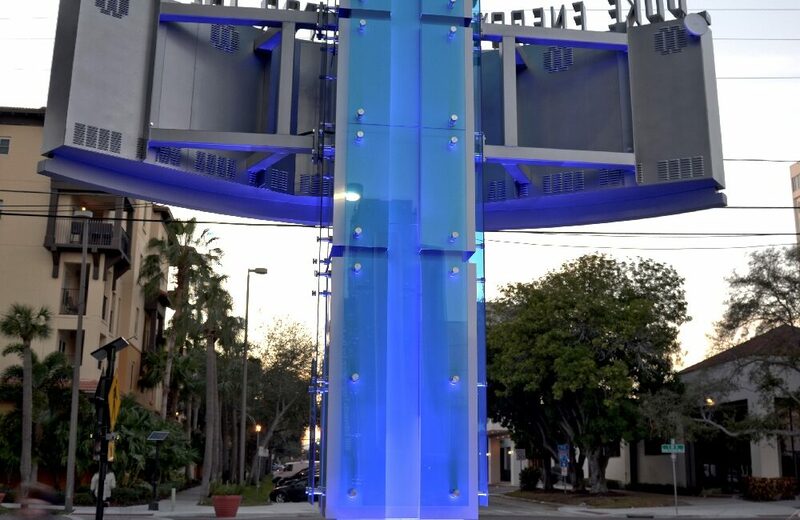 All displays feature optically clear tinted blue acrylic panels, each ½” thick and each standing from the pylons with custom bullet aluminum machined standoff components. The pylon displays are wrapped in a pre-finished KYNAR aluminum coated skin that helps prevent vandalism and helps maintain a long-lasting finish. The client was very clear that he desired a TV Screen quality for the EMC. Creative found D3 LED LLC out of Rancho Cordova California as the vendor of choice for providing this custom curved 6mm display. Along with the crystal clear 6MM EMC, the uplighting components provide the final touch to this Creative Display. CSD partnered with BITRO Group from Hackensack NJ in providing the proper LED uplighting components. 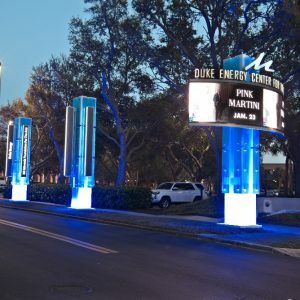 BITRO’s LIGHTPRIZM product, with a 6-degree wash, was the clear choice for the impressive, ultra-deep blue up lighting that bathes these displays during the evening hours of operation. Each set of BITRO up lights were set into a manufactured lighting tray to help prevent damage from landscaping and vandalism.